"When we imagine the landscape of astronomy in the decade of 2030, we realize it is at last within our grasp to make a monumental discovery that will change mankind forever. We hope to learn whether or not we are alone in the universe,” said AURA President Matt Mountain. AURA spearheaded the study of space-based options for ultraviolet (UV) and optical astronomy in the era following the James Webb Space Telescope’s mission (planned for launch in 2018). AURA brought together a team of research scientists, astronomers, and technologists to assess a future space observatory that can significantly advance our understanding of the origin and evolution of the cosmos and whether extraterrestrial life is an integral part of cosmic history. These powerful capabilities would allow the observatory, called the High-Definition Space Telescope (HDST), to look for signs of life on an estimated several dozen Earth-like planets in our stellar neighborhood. It could provide the first observational evidence for life beyond Earth. The scientific research enabled by the Hubble Space Telescope has had a profound and revolutionizing impact on most areas of astronomy over the past 25 years. Similarly, as a general-user space observatory, the HSDT would engage the world’s best and brightest scientists to make transformational advances in astronomy across a wide swath of research areas, from the solar system, to stellar evolution, to the farthest observable horizon of the universe. No doubt, unexpected and profound discoveries are in store, as happened with Hubble. The motive for the HDST is driven in part by the discoveries of NASA’s prolific planet hunter, the Kepler space observatory. Kepler’s discovery of over 1,000 confirmed exoplanets provides a statistical database that predict Earth-like worlds should be common in our galaxy, and hence nearby to us and within observational reach of the HDST. “The monumental endeavor of building the HDST is going to take a continuing partnership between NASA, science, technology, and U.S. and international space missions to build the next bridge to humanity's future," Mountain said. A simulated image of a solar system twin as seen with the proposed High Definition Space Telescope (HDST). The star and its planetary system are shown as they would be seen from a distance of 45 light years. The image here shows the expected data that HDST would produce in a 40-hour exposure in three filters (blue, green, and red). Three planets in this simulated twin solar system – Venus, Earth, and Jupiter - are readily detected. The Earth’s blue color is clearly detected. The color of Venus is distorted slightly because the planet is not seen in the reddest image. The image is based on a state-of-the-art design for a high-performance coronagraph (that blocks out starlight) that is compatible for use with a segmented aperture space telescope. A simulated spiral galaxy as viewed by Hubble, and the proposed High Definition Space Telescope (HDST) at a lookback time of approximately 10 billion years (z = 2) The renderings show a one-hour observation for each space observatory. Hubble detects the bulge and disk, but only the high image quality of HDST resolves the galaxy’s star-forming regions and its dwarf satellite. The zoom shows the inner disk region, where only HDST can resolve the star-forming regions and separate them from the redder, more distributed old stellar population. 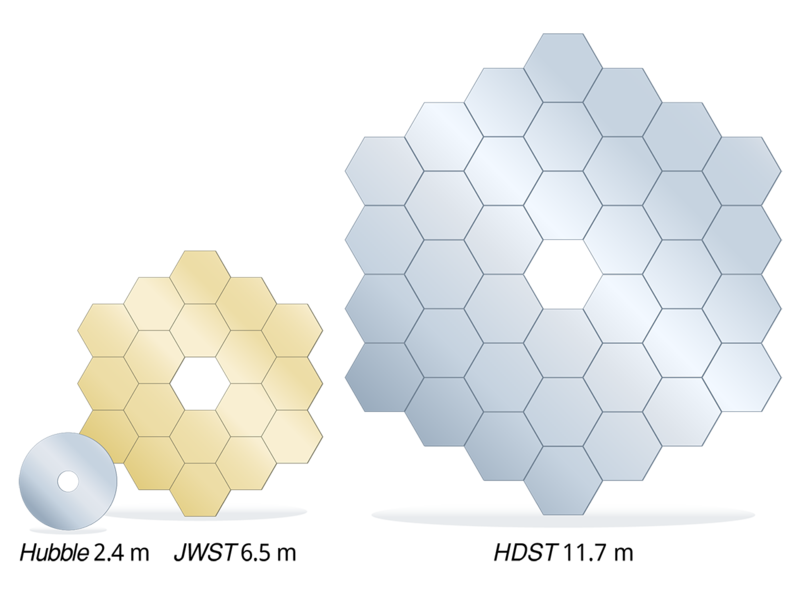 A direct, to-scale, comparison between the primary mirrors of the Hubble Space Telescope, James Webb Space Telescope, and the proposed High Definition Space Telescope (HDST). In this concept, the HDST primary is composed of 36 1.7 meter segments. Smaller segments could also be used. An 11 meter class aperture could be made from 54 1.3 meters segments.